In the greens of metal at the Pebble Beach Concours D'Elegance, one car leapt out at me; a strange red speedster with a Plymouth badge. I had no idea just how strange it was until the owner shared the details of its five-decade journey from speeding around Detroit to dodging mortars in war-torn Beirut. Here's the story of Plymouth's lost jet-age concept car - and its forthcoming digital redemption. Click through the pictures above to read the rest of the amazing story behind this jet-age concept car. 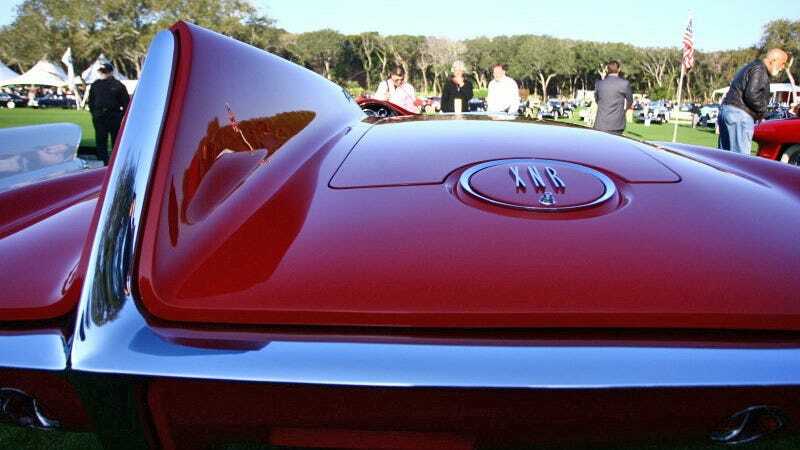 The car is the Plymouth XNR Concept — and it was designed — and likely named — by Chrysler styling chief Virgil Exner in 1960 as a way to explore a grab-bag of influences, namely Jaguar roadsters and jet aircraft. Asymmetrical and low, the XNR has two seats; the passenger side is covered by a cowl, and there's a sizable storage space underneath the fin behind the driver. Built by Ghia in Italy, powered by a Nascar-ready version of the company's slant six churning 250 hp, the XNR was supposed to preview where Chrysler design would head in the futuristic '60s. It also managed to hit 150 mph in testing. But shortly after its reveal and appearance on the cover of "Motor Trend," the XNR was turned back to Ghia and sold to a Swiss businessman. There, it was noticed by Mohammad Reza Pahlavi, the Shah of Iran, who bought the car. It later turned up in Kuwait in 1969, where a "National Geographic" photographer caught it. And sometime in the mid-1970s, the XNR changed hands again and headed to Beirut — just before the country descended into 15 years of civil war. Karim Edde, the XNR's owner for more than two decades, told me that when he bought the car, it was rough but basically straight. "We would move it from place to place, underground, to keep it away from the mortars," he said. After the country settled down, Edde considered restoring the car himself, but the work was too great, so the XNR was sent to RM Automotive in Canada. There, the body was straightened and repaired, while a replacement engine was removed, and a period Slant Six built up with original parts — with some help from engineers who worked on the original — was installed, along with dash instruments to match the original and wheels that feature 30-odd machined pieces in each hub. The XNR quickly drew a steady crowd at Pebble Beach, and won the Gran Turismo Trophy from GT overlord Kazunori Yamauchi — which means it will be offered a slot in Gran Turismo 6, whenever that may be. Kazunori: "The [GT5] Discs Are Being Stamped As We Speak"
It turns out that Virgil Exner was influencing the future far more than he ever knew. You can keep up with Justin Hyde, the author of this post, on Twitter or Facebook.